Amid ongoing raids on Madhya Pradesh Chief Minister Kamal Nath's aides and kin days ahead of general elections, Revenue Secretary AB Pandey has asked the Election Commission to 'confidentially pass on information' about the use of illicit money in electoral process based on its enforcement actions. He was responding to the letter by EC written to the revenue department suggesting that all enforcement action even during election process...'should be absolutely neutral, impartial and non-discriminatory.' It had suggested that in case if suspected use of illicit money for electoral purposes, the CEO should be kept suitably informed. In response, the revenue secretary urged the EC to advise its field officers involved in the enforcement of the Model Code of Conduct to take immediate enforcement action at their end under the election and other appropriate laws, if they come across any specific information about use of illicit money in electoral processes to check and eventually eliminate the use of unaccounted money in election. "They may also, if deemed fit, pass on the information confidentially to the Incomes Tax department for taking further necessary action," he added. Pandey in the letter further said that operations must be based on information and actionable intelligence available with the income tax authorities. We understand what the words 'neutral', 'impartial' and 'non-discriminatory' mean and we must act as and when information is available against anyone, irresponsible of political affiliation." As per the income tax department, searches at MP CM Kamal Nath's kin's and aides' premises yielded unaccounted cash of Rs 14.6 crore so far, besides 252 bottles of liquor, few arms and hide-skins of tiger. Besides, accounts with unaccounted cash of about Rs 281 cr were recovered, including transfer of Rs 20 crore to the “headquarter of a major political party in Delhi”. 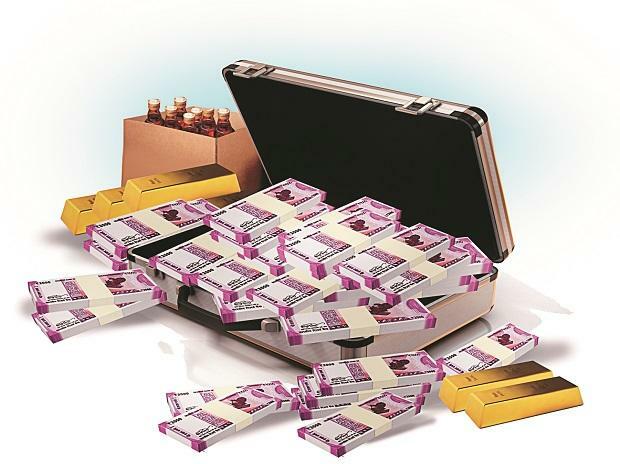 With former central board of direct taxes chairman Sushil Chandra at the helm, the ECI has seized over Rs 1,800 crore in form of cash, drugs, gold and liquor across the country. The ECI has also been carrying out seizures across the country. Drugs worth Rs 700 crore have been recovered, mainly from Gujarat and Punjab, whereas Rs 473 crore worth of cash has been seized so far. In addition, Rs 410 crore worth of liquor and RS 175 crore worth of liquor has been seized by ECI.